We all know how enamored I am with pink these days. 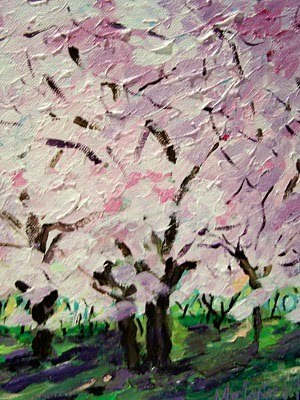 Well Melanie of Pretties and Posies is giving away a dynamite painting entitled "In Bloom on Old Mission." I just love it. I know it will look great in my home. But if you are feeling a bit luckier than moi, visit Melanie and enter her giveaway. Just don't be disappointed when it comes to my house. The giveaway runs until April 10th. I want it at my house! !